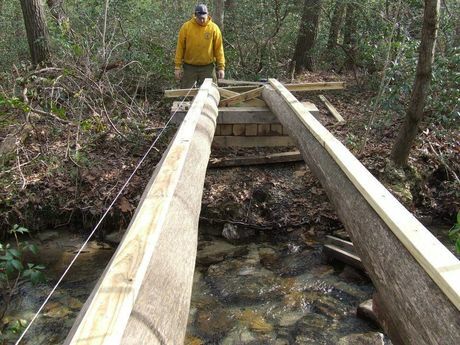 The Foresters had the supports on either side of the creek built prior to the workday. 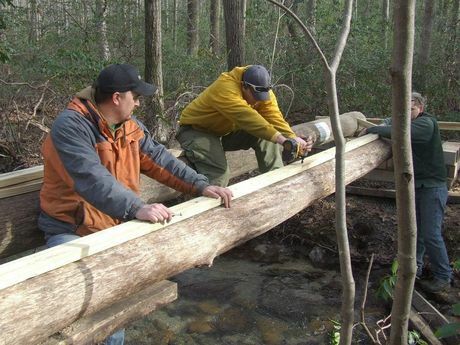 The workday crew starting setting the logs across the Rattling Creek. 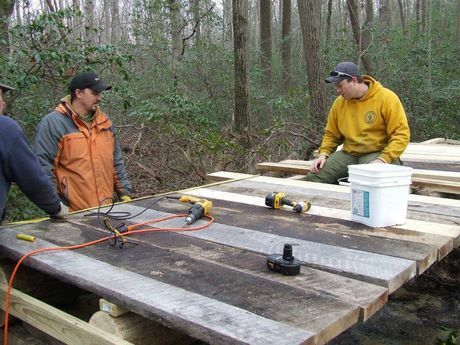 Next, the crew set bracing and placed boards on top the logs to level the planks. Later planks were fastened to the boards. Another great job by the Friends of Weiser volunteers and the park foresters! Well, we got the job done! it actually went easier and much quicker than any of us expected. We got both logs down the trail and across the creek, with no problems and didn't even mess up the handicaped trail at all. We had a good bit of help on hand, but we could have used one extra person when it came to the lifting. So we grabbed a randon biker early and a random horseman later right off the trail to help us. They had no idea when they came to Weiser that day that they were going to be carrying logs down a trail by hand! Thanks to these two kind people for all their help! Besides moving the logs we trimmed back the split rock trail which was trying to grow closed, then we cleared out the lower end of Wolf Pond trail which doesn't get used as much and was a real mess. We also put mulch around the hitching rail. It was a good day and we want to thank everyone who came out to help with our projects that day! You make a difference! Mark you calenders for Oct 21. We are planning an open house and chicken barbecue that day. We will be getting more details out to you later. 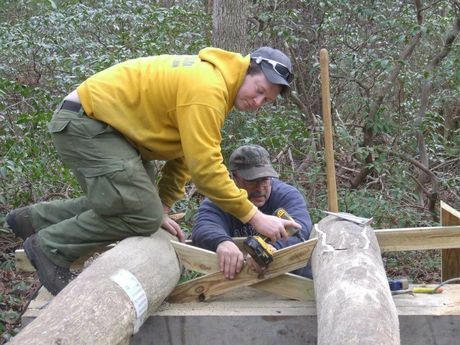 Some of our group worked on the Troutman Trail while others worked on the Hitching Post. The trail work went slower than last time mainly because of the distance we had to haul the stone this time. When volunteers left that day there was still a good bit of work left to do on the trail and they were able to complete it on November 13. Andy is thinking we will probably not work on it again till spring. Thanks everyone who came out to help. 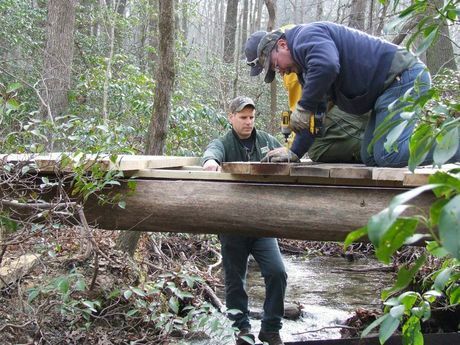 We officially began building the new trail for the Troutman Woodland Demonstration Area. This is a hiking trail only and will have talking points along the trail explaining the various stages of forestry preservation and renewal. This trail is easily accessible with equipment which helped tremendously throughout the day. The equipment operators would haul a load of gravel to the trail, dump their buckets, and then backdrag the pile to make the pathway. Volunteers with stone rakes would clean up any high spots left by the equipment. The weather was beautiful and the conversation was bountiful as we all worked on the trail together. We completed about half of the proposed trail. Hopefully one more nice day and the other half should be done as well. 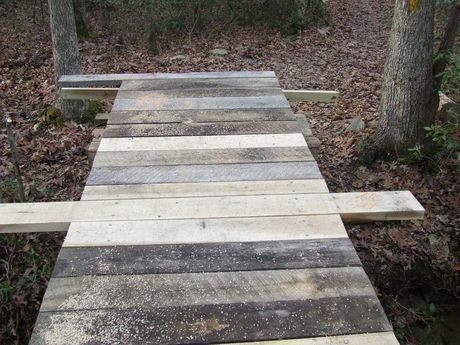 Trail makers will finish off the trail for visitors to follow along the meandering path. Some work also was started on the hitching rail at Minnich's Hit Picnic Area while some of us leaned on our rakes and watched the equipment go back and forth for loads of gravel. WE DECLARE THE PHYSICALLY CHALLENGED TRAIL COMPLETE! We had a grrrrreat work day. We had 8 people, a tractor and a front end loader working from 10am until 3pm in humid hot weather. We thank our friends - Scott, Chris, Grant, Mary Ann, Don, Nick and Mike for joining Jim this last day and completing this project. All that is left is for DCNR to put up signs and then we think a party is in order! We’d like to plan a picnic and invite some friends to try out the new trail. We’ll keep you informed on this picnic with friends! Our work is not done! We have the beginnings of our next project waiting for us. Nick got the permit to put a bridge in at the end of the trail and the trees are already cut for the tussles. Thank you everyone who helped with this project since we started it. We had a great work day Sunday, June 5th. We had a small but very ambitious group at work and got a lot accomplished. Next time we are hauling some more large rock down from the top to line the trail again. Also work is proceeding with the hitching rail for horses that we are putting in across from the picnic grounds. Don Newcomber did a scale drawing of what it will be like. DCNR has the material to make it out of and Don has volunteered to do the welding. Nick will be having posts put in so we can do hand boxes to put info in about our group. A want to give a big thank you to everyone who helped on Sunday! We had our second workday at Minnich's Hit on April 9, 2011. Volunteers started laying out all the rocks gathered from the first workday on March 19, 2011 to line the edges of the handicapped trail. We used wheelbarrows to haul small stone that will be used to build up the trail tread. We also had some muscle from a bobcat bringing the rocks farther down the trail. Our work was followed up with a delicious lunch. At our next workday, we will be addressing the wet areas by using fabric and geocell to build up these sections along the trail. This was the Friends of Weiser's first workday for the extension of the handicapped trail at Minnich's Hit. Group members, local 4-H Trailblazers, and DCNR volunteers loaded up heavy rocks into the back of trucks and trailers. They then drove to the Minnich Hit Picnic area to have them unloaded. Some folks had the help of our good friend Hydraulics! While others had to unload by hand. Everyone worked hard, and celebrated with a resting lunch at the picnic grounds. Thanks to everyone for your hard work.